If you have daytime Summer wedding or event going on, what looks better than a beige color double breasted suit. Double breasted suits are for men who take style a little more seriously than other men. The double breasted style is all about knowing who you are and where you're going. 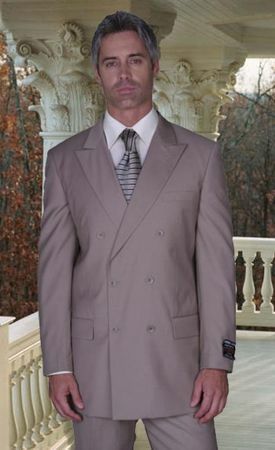 This beige double breasted suit features that classy Italian style 6 button front jacket with the peak style lapels and pleated pants that are unfinished and ready for hemming. Made of fine wool feel poly/rayon.